In the boxing day sales, I finally managed to obtain a black blazer. It's not easy to find one that fits well for a decent price so I was extremely pleased with this £20 find from Mango. The lapels sort of refuse to fold back but I think it looks pretty nice like this. 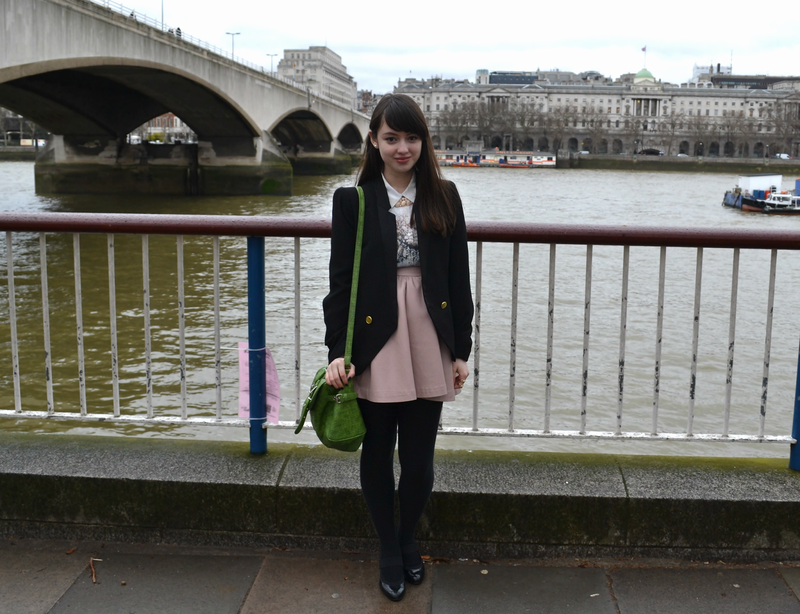 I went with a pale pink combination for the rest of the outfit and contrasted everything with my trusty green bag. I'm still enjoying the Winter Olympics and got really into the women's figure skating today. I did a tiny bit of skating when I was younger so I like to pretend I know what's happening even though I haven't really been following since the last Olympics. There was some brilliant skating going on and some good and bad surprises, including my favourite Mao Asada falling and ending up in 16th place. At least skaters who fall get back up again, right? I loved watching the Olympics too, the skating is very pretty. I also used to skate but that recurring nightmare when I was 6 of someone skating over my hands and chopping all my fingers off put an end to that one. I love your blazer and skirt- I always forget about Mango which is a crime. The blazer is so good because, like you say it's well fitting and a little unconventional with the collar! My friends have had people almost skate over their hands! It's not a pleasant thought. I usually forget about Mango too but they do have some great sales!